Almost 25 percent of Costa Rica is designated as national park or protected land, making this beautiful country a desirable destination for eco-conscious travelers. Melding all the delights of Costa Rica luxury hotels with untouched expanses of jungle creates a memorable vacation that is a mix of adventure and supreme relaxation. Whether you prefer whizzing through the treetops on a canopy tour or strolling barefoot along quiet stretches of beach, Costa Rica offers the trip of a lifetime. In a country of lush, primal beauty, it’s often hard to provide breathtaking scenery. But the stepped hot springs at Tabacón Grand Spa Thermal Resort make this one of the most unique luxury hotels in Costa Rica. Set between the awe-inspiring Arenal Volcano on one side, and a nature reserve on the other, this exclusive resort features natural mineral hot springs for bathing. Appetites will be satiated with exotic cuisine and every need pampered at the spa before retiring to the oversized guest rooms for the night. • Accommodation type: 4-star hotel. • Pricing: $262 – $630 per night. • Booking: click through the reservation portal on the home page. Reserva Conchal, one of the most unique Costa Rica luxury hotels, enjoys an exclusive location just minutes from the clear waters of Brasilito Bay. Enjoy delicious Costa Rican-inspired cuisine at the end of a fun-filled day playing golf on the resort‘s private course or count the species of exotic birds on the 96-acre private reserve where the hotel is located. • Accommodation type: 5-star hotel. • Pricing: $234 – $950 per night. • Booking: click the Book Now button on their home page. Beachfront splendor reigns supreme at Azul Ocean Club, where waterside luxury cabanas provide a respite from the warm sunshine. While soaking up the sun and listening to the music of the waves is the perfect way to relax, there are a number of fun activities to enjoy, like nature treks through nearby Palo Verde Park or riding an ATV through the jungle. • Pricing: $138 – $322 per night. • Booking: click through to their reservations portal. Minutes by foot from Playitas Beach, Arenas Del Mar is located at the same level with the treetops, overlooking the blue waters of the Pacific Ocean. Each of their tastefully appointed premium suites features a private balcony with hot tub overlooking the ocean. Visit nearby Manuel Antonio Nature Reserve to discover the plants, birds and animals that make Costa Rica famous for its biodiversity. You can return from your adventures to relax with a spa treatment or to sample delicious Costa Rican cuisine at the on-site restaurant. • Pricing: $364 – $1,010 per night. • Booking: click through to their reservations page. The Springs Resort & Spa at Arenal features the impressive heights of the Arenal volcano peak rising from lush jungle as a dramatic backdrop. Bath in stone-lined hot spring pools with splashing waterfalls and take a rafting safari down the pristine Peñas Blancas River. Rock climbing, rappelling, kayaking, nature hikes and bird watching—there’s a little something for everyone at this spectacularly beautiful jungle oasis. • Pricing: $327 – $791 per night. • Booking: click through their Reservations portal. 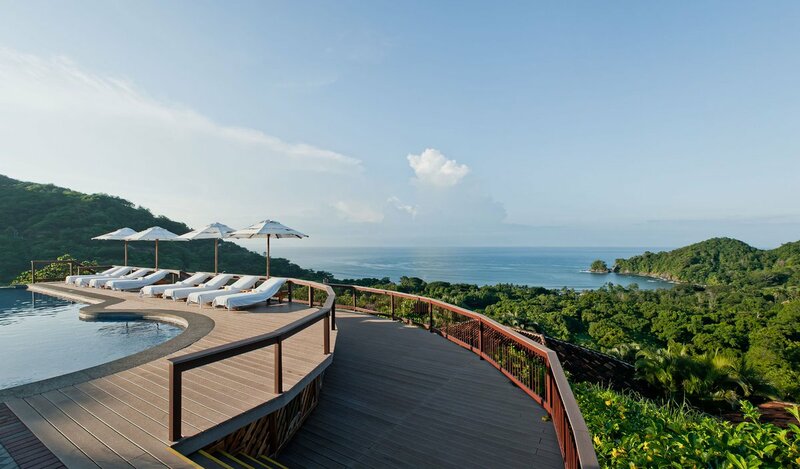 The Four Seasons Resort at Peninsula Papagayo boasts two private beaches and three swimming pools for guests to languidly soak up the sun. The resort‘s waterside location makes a spectacular backdrop for the on-site, perfectly manicured golf course. Bird watching tours, merengue classes, spa treatments and cooking demonstrations all make wonderful ways to fill each day. In the evening, savor South American cuisine while watching the sun set over the water. • Pricing: $594 – $2,086 per night. • Booking: click the Make a Reservation button on their home page. A highlight among Costa Rica luxury hotels, the Hotel Punta Islita features sweeping views over the Pacific Ocean and private villas with their own hammocks on the porch. Enjoy the infinity-edged pool and swim-up bar, plan a horseback ride along the beach, dine on Costa Rican favorites in the spectacular palm-thatched dining room or trek through the rain forest at dusk on a guided tour of Costa Rica’s nocturnal animals. • Pricing: $282 – $604 per night. • Booking: click through to the reservations portal. • Ideal for: couples and families. Ensconced within a private reserve, the delicate cloud forest is particularly famous for its variety of rare bird species, making this one of the only Costa Rica luxury hotels that offers accommodation in one of these ecologically fragile environments. When you’re done exploring the rain forest, relax with a hot stone massage in the beautiful spa and sample delicious dishes prepared with food grown right in the hotel’s greenhouses. • Pricing: $206 – $249 per night. • Booking: call 1-877-256-8399 to reserve. Rooms with private infinity plunge pools framed by lush jungle vistas welcome travelers to Nayara Springs. This exclusive retreat in the midst of protected forests makes a good base for exploration of wonders like the Arenal Volcano or the hot springs of Eco-Termales. Take a zipline adventure to soar high in the treetops or explore the rain forest on horseback. Their award-winning spa and imaginative cuisine make an alluring alternative to adventure. • Pricing: $602 – $957 per night. Los Suenos Marriott. There’s La Iguana, an 18-hole golf course, zip-line canopy tours, strolling on a nearby beach or spending time in the spa to while away the hours. The resort‘s attentive concierges can arrange a catamaran tour to Tortuga Island just off the coast that will have you back just in time to enjoy a candlelit dinner with views over the water. • Pricing: $249 – $694 per night. • Booking: located on their Reservations page. In a country that protects five percent of the world’s biodiversity within its compact size, the wonders of the Costa Rican jungle offer visitors a glimpse of exotic creatures and rare plants. There’s a harmonious balance between the wild beauty of the jungle and the luxurious comfort of Costa Rica luxury hotels that make this destination unique. If you’ve been lucky enough to travel to this wonderful country, tell us your favorite experience in the comments.